The discovery of the I-52 in over 17,000 feet of water on May 2, 1995 was the culmination of a five year research effort by Paul Tidwell. The I-52 was a cargo carrying submarine enroute from the Kure Naval Yard in Japan to German occupied France. This specially designed submarine was to play a very important role in the commerce of strategic materials and technologies between the Axis nations. The Allied intelligence network intercepted and decoded messages revealing that the I-52 was carrying two tons of gold to purchase German optical technologies. In response, a carrier task force was dispatched from Norfolk with orders to engage and sink the I-52. On the night of June 23, 1944 the I-52 rendezvoused as planned with the German U-530 in the mid-Atlantic. Later on that night, torpedo carrying planes from the USS Bogue engaged the I-52 in a deadly game of cat and mouse. Although the U-boat escaped, the I-52 with her precious cargo of gold would not be seen again for over fifty years. Paul Tidwell spent over five years researching archives of American, British, German, and Japanese origin. As a result of his research Mr. Tidwell became convinced that the I-52 was findable. With his research in hand Mr. Tidwell contracted Sound Ocean Systems, Inc of Redmond, Washington, to provide a deep ocean search and documentation capability. Tom Dettweiler of Meridian Sciences and Bob Cooke of Sound Ocean Systems served as the at-sea operations managers. In addition, Meridian Sciences provided systems and analysis support. In April of 1944, the Axis empire was surrounded. Faced with a tightening naval and air blockade, and in desperate need of war materials, the Nazis sought every means to exchange supplies and information with their Japanese partners. The Japanese, in turn, were in need of technology and instruments, manufactured in Germany, for which they were willing to pay dearly. These commodities were traded through the only means left: with specially-built, huge cargo carrying submarines. In this context, the Japanese I-52 began her maiden voyage, destined to end at the bottom of the Atlantic. The I-52 left Singapore with a cargo of tin, medicinals, and rubber, along with a secret cache of gold, bound for a large submarine base on the western coast of France. The vessel, weighing 2,500 tons, was manned by a crew of over one hundred, including a cadre of engineers and technicians. Receiving coded messages from German headquarters, the submarine aimed to rendezvous in the middle of the Atlantic ocean with the U-530, a German U-boat. Unknown to the Axis vessels, the Allies had broken German and Japanese enigma encoded messages. Hoping to catch both submarines at once, a carrier task force, led by the USS Bogue, was dispatched to the scene. USS Bogue heading out to sea. On June 23rd, searching at night and in poor weather, flights of Avenger dive bombers were launched to scour the area. Each Avenger aircraft was loaded with depth bombs, sonabuoys, and a top secret acoustic homing torpedo. After long hours of search, avenger pilot Lt. Commander Jesse Taylor finally spotted the I-52. Cruising on the surface, the crew was rushing to prepare the ship to dive following the just-completed exchange of supplies with the U-boat. When the sound of Taylor’s aircraft reached the bridge of the I-52, it was too late. The events that followed … propeller noises picked up by sonabouys, the exploding torpedo, and the agonizing sounds of a ship breaking apart … were all recorded for history on a wireless recording device. Later the next day, the task force ships arrived at the site, finding tons of floating rubber and other debris. Although the U-boat escaped, the I-52 with her cargo of gold would not be seen again for over fifty years. Many of the records from World War II are kept in the National Archives in Washington D.C. There historian Paul Tidwell found the actual log of the aircraft carrier Bogue which describes the action of events surrounding the I-52 on June 23rd and 24th, 1944. Also found was Commander Taylor’s report of how he located and sank the I-52, logs from other ships in the task force, and even the war diary of the U-530. The pages contained the secret of the location of the wreck of the World War II Japanese submarine I-52. Paul Tidwell had been looking for the I-52 and other historical shipwrecks for many years. 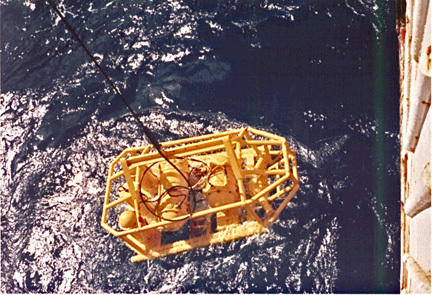 Paul sponsored an expedition to search for the sub, and hired Ted Brockett of Sound Ocean Systems, Inc. to manage the project. Ted in turn, relied on Nauticos Corporation, at the time called Meridian Sciences, to fill key roles, with Tom Dettweiler serving as Operations Director and David Wyatt responsible for the operation of the ORION sidescan sonar image processing system. Jeff Burns, Nauticos’ Director of Marketing, was also aboard, standing watches and documenting the events of the cruise. Assisting Tom was Sound Ocean System’s Bob Cooke, a seasoned veteran of ocean exploration. The Russian R/V Yuzhmorgeologiya and its equipment were used in this deep water search operation. The chronicle of the discovery of the I-52 begins with the mobilization of the ship, crew and equipment, staging from Bridgetown, Barbados, in the warm, sunny Caribbean. Tom Dettweiler, David Wyatt and Jeff Burns met with Paul Tidwell to discuss the details of the operation. The technical challenges were clear: the wreck was expected to lie in depths near 17,000 feet, where water pressures approach 8,000 psi. Instruments must be towed or dangled at the end of miles of armored steel cable, which provides tether, power, and telemetry to and from the cold, absolutely dark depths. 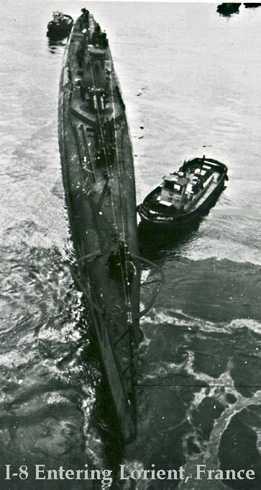 Battle damage and the tremendous implosive force of the crushing seawater would likely leave the wreck in small pieces of debris, rather than an intact hull. Because light can travel only a short distance in seawater, photography or video cameras are ineffective for undersea searches, where dozens of square miles must be combed to have a reasonable chance of finding a wreck. However, swaths of ocean bottom up to many kilometers wide can be painted by the use of sonar. The sound that is generated by the sonar is reflected, received, and processed to produce a sonic image of the area. Today’s technology produces images at resolutions adequate to detect a metal hull or debris field. In this way, the crew hoped to locate the wreck of the I-52. 100KHz Enhanced Sonar Image of the I-52. The Yuzhmorgeologiya, after passage through the Panama Canal, arrived at Bridgetown, Barbados on April 11th. The science crew boarded the Russian research ship that would be home for the next 30 days. Paramount among the many tasks faced was the final assembly and sea trials of the camera sled, the Deep-sea Probe 6000. Built by Sound Ocean Systems, the vehicle was to serve as a capable back-up sled to the Russian built NEPTUN. The expedition departed Bridgetown Harbor on April 12. The next day Paul and Tom held a meeting for the science party to explain the survey plan. Paul’s estimated position of the shipwreck was based upon the carrier USS Bogue’s reported position when her aircraft had engaged the I-52. 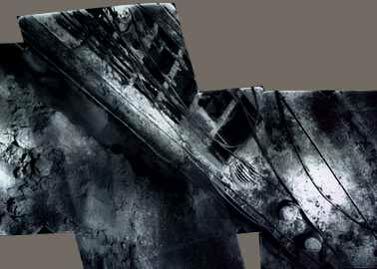 Tom experience led him to believe that the wreck would have strewn debris across the bottom in a unique pattern that would stand out from its surroundings. Accordingly, the Russian team adjusted the MAK-1M side scan sonar to detect this type of target. Tom and Bob designed a search plan to account for the currents and bottom conditions expected. The Yuzhmorgeologiya would tow the sonar in an easterly direction at 1.5 knots at and an altitude of 100 meters off the bottom, avoiding the sharp ridges found every 4 to 5 km. At a frequency of 30 kilohertz, a range of 1000 meters, and survey lines spaced 1000 meters apart, the MAK-1M sonar would ensonify every half meter of ocean bottom twice. After two weeks of searching and analyzing the data collected from this area, the I-52 was not to be found. Tension and frustration began to build among the crew. New scenarios began to emerge from re-analysis of the historical records. Tom and Bob considered the possibility that the I-52 may have survived the initial attack. With our primary search area covered, it became very clear that if the expedition was not able to find her close by, it was going to be a very long search extending over many miles of the Atlantic. Meanwhile back on shore, Dave Jourdan was using Nauticos’ RENAV system to re-construct the tracks of the vessels involved and develop a more accurate position based on the original logs of the surviving ships. The location reported by the Navy was based on real-time navigation of the era, using celestial fixes and rough dead-reckoning. The accuracy of their estimates was compromised by many factors, including bad weather, winds and currents, frequent maneuvers during flight operations, and zig-zagging to avoid enemy detection. These factors kept the crews from obtaining good star fixes and accurately updating positions. Of course, the crews were less concerned about their precise location (in the mid-Atlantic) than they were concerned about the relative location of the enemy. Finally, since the attacks occurred so far away from the ships, the geographic location uncertainty of aircraft after several hours of flight time (in high winds at night) added to the errors in reported position. As the searchers neared completion of their search in the primary sector, the staff at Nauticos intensified their RENAV efforts. Paul’s research had been made available just before the ship’s departure. A rather unique approach was used involving software originally developed to analyze and reconstruct tracks from modern nuclear submarines. This software helped analysts at Meridian generate dead-reckoning tracks of the World War II vessels over several day periods. These data were fitted to position estimates using a Kalman filter, estimating bias, scale, rotation, and other errors in the tracks. This allowed many fix estimates from different vessels over a long time period to be integrated statistically, refining the positioning at any particular time. Many available observations of the attack and wreckage were compiled, yielding a position estimate for the site of the sinking. This was in turn adjusted for current drift as the wreck made its more than three-mile journey to the bottom of the ocean. The result of this analysis showed the location of the I-52 to be over 10 miles from the Navy’s originally-reported coordinates. Plots and supporting information were sent to the ship via electronic mail over satellite communications. After considering the new data, along with supporting results from manual analysis done on board, the Yuzhmorgeologiya rushed to search the new area before dwindling fuel and supplies forced an end to the cruise. With fuel reserves critically low, the searchers were forced to cover the secondary area as quickly as possible, searching without the overlap that had been used in the primary sector. By now, Paul was very concerned that he would not have enough fuel to properly document and identify the wreck even if he did find it. Without a proper claim, five years of Paul’s work and the money thus far invested would all be in jeopardy. Tom and Bob, concerned with the safety and success of the entire expedition , planned for us to continue our search until the 3rd of May. As the searchers worked their way to the southern end of the secondary sector, their luck changed. Shortly after breakfast on May 2nd a small image appeared on the sonar screen near Dave Jourdan’s renavigated position. Dr. Midkat Ibreav, the designer of the MAK-1M, was the first to spot the target on his acquisition display. Digitally reprocessed images from Nauticos’ ORION software showed a strong return and a debris field. At 3:30 AM on May 3rd the searchers obtained a 100Khz high-resolution image of the target, showing a (surprisingly) intact hull, conning tower, and scattered remains of the damage that must have occurred during the attack and the descent to the ocean bottom: strong proof that this was a submarine wreck. A tremendous sense of relief was felt among all those present, as Paul’s five year search for the I-52 had come to an end. Using the NEPTUN sled, with video and still cameras, the Yuzhmorgeologiya began its photographic survey of the wreck site. Dr. Valeriy Kazachenok skillfully controlled the sled, keeping it a few meters above the seafloor at the end of 7000 meters of cable, while capturing the amazing photos displayed in the photo mosaic below. The following information was extracted from Top-Secret documents intercepted by US intelligence and from Top-Secret reports describing the attack patterns followed by Lt. Cmdr. Jesse Taylor and Lt.(jg) William Gordon in sinking the I-52. At approximately 11:40 on June 23rd, Jesse Taylor spotted the I-52 on the radar of his avenger aircraft. Allowing for speed and altitude, Jesse Taylor directed his aircraft over the target, and commenced the attack. The first pass produced two near misses by depth bombs. Taylor could look over his shoulder and see the explosions just to the starboard side of the submarine. As Commander Taylor’s watch ended, Lt.(jg) William D. Gordon flew to the scene of Taylor’s attack to continue the vigil. Gordon was given the orders, “to drop a Mark 24 mine if sonobuoy indications revealed the presence of a submarine in the area.” The logs and all communications refer to a Mark 24 mine. This was a code name for the top secret acoustic torpedo that was being used in war for the very first time. Gordon had civilian underwater sound expert Mr. Price Fish on the plane with him. Gordon arrived on the scene just after midnight, and circled with Taylor for some time. At about 1:00 a.m., Mr. Fish reported hearing some faint propeller noise in the area. Gordon checked with Taylor about the exact position a sonobuoy, and then dropped a top secret acoustic torpedo where he believed the submarine to be. Taylor departed from the area at 1:15, but Gordon stayed to circle the area and listen for any sign of activity. He heard nothing, and was replaced by Lt.(jg) Brady, who continued to watch, and listen to the activity, but no further activity was reported.